A global leader in bulk handling technology has introduced a more effective return belt tracking system that uses high-quality materials for easier maintenance and a longer unit life. Used for lower tension belts from 500 ¬¬–1500 mm (20 – 60 in.) in width, running at a speed of up to 5 m/s (984 fpm), crowned roller trackers have a slightly larger diameter at the centre than at the edges. Realignment is based on the basic principle of the belt contacting the raised portion of the raised portion of the roller first (the crown) first. When the belt wanders off-centre, the assembly tilts to the opposing side and steers it back toward the normal position. By retaining a consistent path on the return side, the belt passes over the tail pulley and enters the loading zone centred, delivering equal cargo distribution and reducing spillage. Previous designs had lagging made out of a single smooth piece of rubber or soft gripping material, to retain a hold on the belt and train it back into position. Being in constant contact across the entire surface of the belt caused the material to wear quickly, requiring frequent and expensive replacement. The Martin Roller Tracker improves on this technology with ribbed lagging made from thick, rugged polyurethane. Covering the entire belt width using less surface contact, the ribbed design reduces lagging wear and improves resistance to better train the belt back to centre. This design is also very cost-effective to manufacture, contributing to a reduced purchase price. With fewer working components than its counterparts and no contact with the belt edge, the Martin Roller Tracker also has a smaller diameter of 190 mm (7.5 in.) 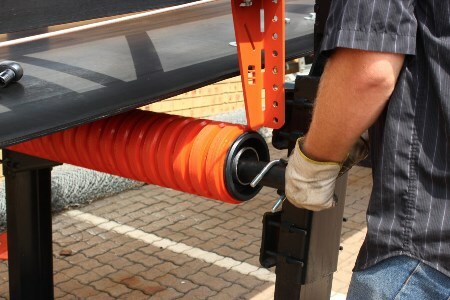 – similar in size to other rollers ¬– allowing it to react quickly to fluctuations in the belt path. Built on a central pivot attached to a stiff, vibration-free mandrel, the unit is lifted 5 mm (.2 in.) under the belt to retain a tight grip on the surface. As the belt drifts, the roller constantly tilts and turns, reacting to the direction of the belt’s drift. Engineered with heavy-duty, permanently-lubricated sealed bearings, the Roller Tracker’s internal mechanism features an additional hydraulic seal to prevent dust and spillage from contaminating the inner works. The washer seal and nylon casing protect internal components from dust buildup and abrasion that cause some roller designs to seize and create a potential fire hazard. The result is longer unit life, increased performance and improved workplace safety. Requiring a stringer width of 675 mm to 1842 mm (26.5 to 72.5 in. ), the mandrel is held firmly in place by a U-bolt that is easily adjusted up and down using the vertical holes on the bracket. After installation, replacement and maintenance is a one-person job using only a socket wrench. Cleaning is as easy as hosing it down and does not require removal. A standout trait is the easy installation and maintenance of the unit, secured by two specially designed low-footprint brackets taking up only 50 mm (2 in.) on either side of the mainframe. The pitch of the bolts holes is such that they would fit any return idler bracket spacing, which eliminates the need to drill additional holes in the stringer.